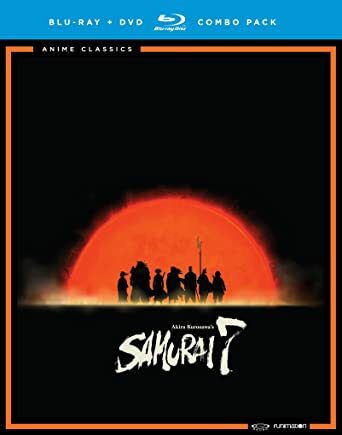 Based on the Akira Kurosawa classic SEVEN SAMURAI, this anime series updates the action of the film to a bleak future overrun by bandits. These men are former samurais who have abandoned their code of honor and adapted technology to their bodies until they no longer resemble humans. When a small village can no longer stand against the marauders, they call on the skills of a group of samurais to save them. This release includes every episode of SAMURAI 7. Samurai 7 is set in a futuristic world that has just seen the end of a massive war, many villages are being terrorized by Nobuseri bandits. The Nobuseri are no normal bandits. They were once men, but during the war they modifed themselves with machines to become living weapons and now apprear as more machine than man. A group of villagers decide to hire samurai to protect their village. These men of valor are as skilled as they are unique. THEN SEND IN A COMMENT ABOUT YOUR FAVORITE FUNIMATION TITLE (you may click on artwork above for a refresher) PLUS YOUR NAME AND ADDRESS TO contests@efilmcritic.com or WeLoveHBS@aol.com. (Just one e-mail please.) Put [b]"THIS IS LIKE THOSE MAGNIFICENT GUYS, RIGHT?" in the subject line and cross your fingers. We will draw names and one of the prizes could be yours. Only 1 entry per household.